Opposites for you, Opposites for me! I’m starting to prep my room for the celebration of Dr. Seuss’ birthday. His stories are so useful in my therapy room because of all the language concepts embedded into them. I like starting by introducing the stories “The Foot Book” and “One Fish Two Fish, Red Fish Blue Fish”. These are fun, shorter, engaging stories with many opportunities for follow-up crafts! Category Sort: 32 pictures get sorted onto a category mat for the groupings of fast/slow, wet/dry, day/night, small/big. 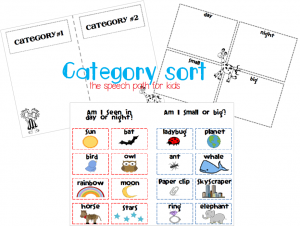 Choice of mat to sort between 2 or 4 categories, based on level. 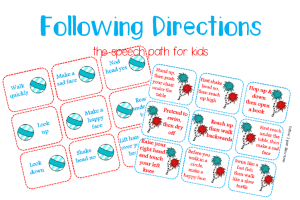 Following Directions: 36 direction cards using the opposite concepts in this unit. 18 one step and 18 two step directions incorporate right/left, high/low, up/down, slow/quick, sad/happy, no/yes, under/over as well as on, in, open, backwards. 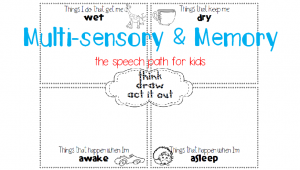 “Think, Draw, Act it out”: Use the memory strategies of a multi-sensory approach to be active with 8 of the concepts. Template uses 4 on a page (happy, sad, day, night/wet, dry, awake, asleep). Dominoes: Match concepts to their opposites to build a dominoes board (stop/go, up/down, night/day, awake/asleep, left/right, wet/dry, slow/fast, sad/happy). 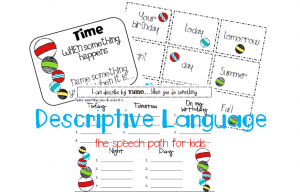 Students can practice creating sentences to show the word meaning and the opposite concept. Vocabulary Pocket Chart Strips: 9 strips to preview, teach, and review common vocabulary used within this unit. 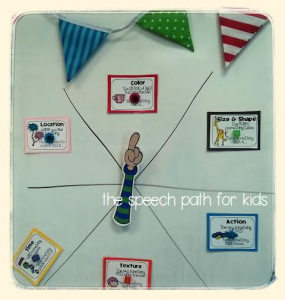 I love doing crafts as extension activities because they are an amazing way to elicit communication. 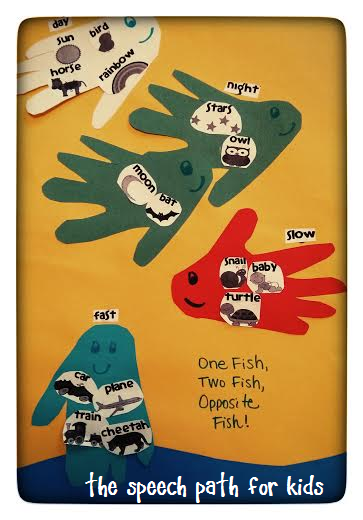 We make all kinds of fish depending on the goals (articulation sounds, basic concepts, multiple meaning words, etc). 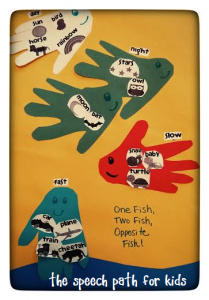 Here is an example of our “opposites fish” using the pictures from the category sort. I had 5 rectangles pre-cut with my fish colors then helped the students trace their hands and cut them out. If you needed to save time you could have the water and background paper pre-assembled also. We glued the labels onto each fish then sorted the pictures. Again, you could differentiate the level of this sort for each child. My kids L.O.V.E. to use the spinner station. I was so pumped to find a Seuss style spinner – and at the dollar store of all places! 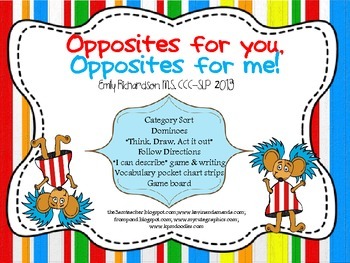 The board is set up with the category title cards and then the cards for each category will be in a Dr Seuss bag (from the Target dollar section). I’ll also draw another spinner station on the board with some actions to practice articulation sounds. I hope these ideas will be helpful for you and save you some time! 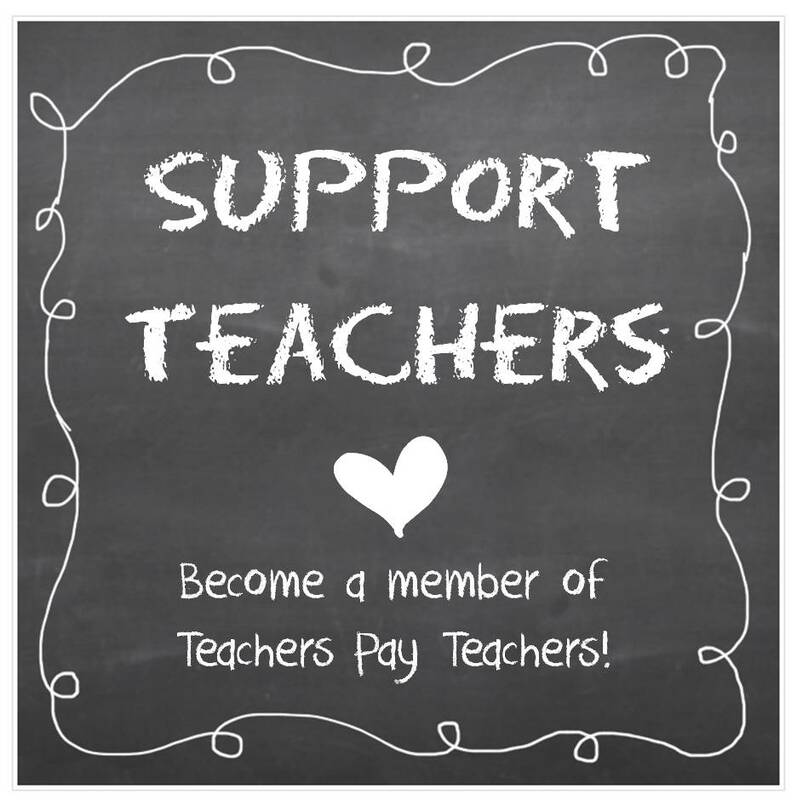 I’d love to hear how you teach opposites and basic concepts.